When a project is being executed, all the methods and decisions that have been done or will be done then are evaluated to enhance it further to achieve the unit goal, you call it evaluation plan. 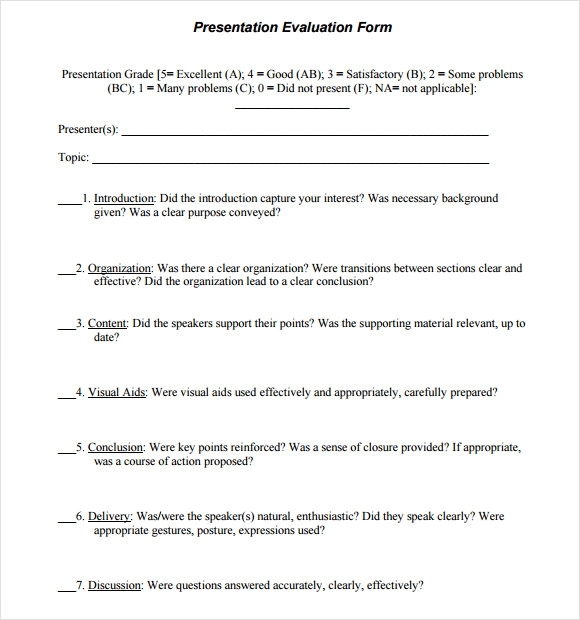 This Sample Evaluation Templates assessment tool sets out the standards, questions and criteria that must be formulated in order to measure the effectivity of a process if it’s beneficial or not to obtaining the project goal. The example template has the preferred download format for you to easily formulate samples needed to make the necessary information in improving the grant proposal for a project. This Sample Presentation Evaluations can set if the goal and objective of the project has been achieved and if not provide the necessary steps to have it. This is perfect for any school or a teacher in any grade level and this one is simple, yet concise. It has various categories that can be scored as improvement needed, good and excellent, including visual aids, performance and content of the presentation. This is great for anyone to use, including an employer or employee who needs to give feedback on the given presentation. They can give feedback about what the person doing the training did to encourage the participants and more. 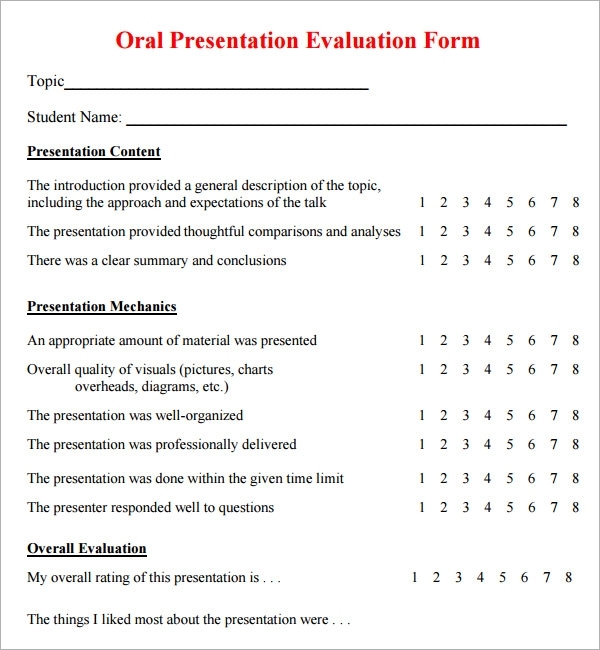 This is another great option that can be used for teachers when it comes to grading the presentations of their students. It gives levels 1 to 8 for different categories, such as content, presentation and an over-all rating from the teacher. 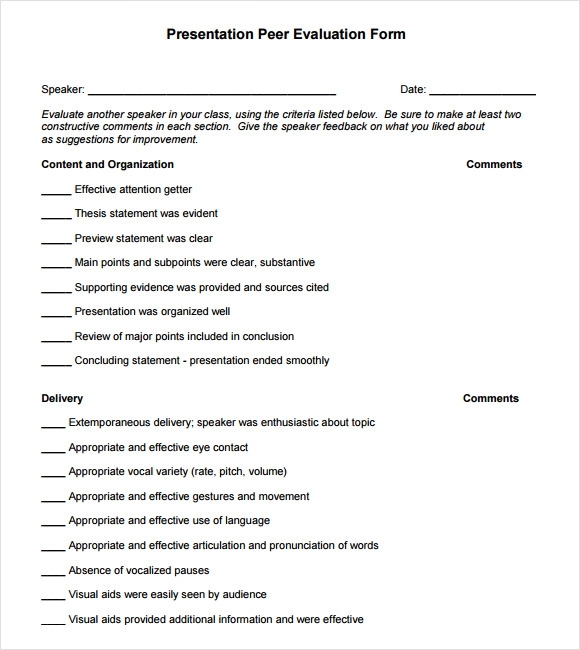 This is a great template that can be used by teachers of all grades for any presentations. It lists the number of possible points for every category, including creativity and originality, organization, presentation and knowledge of the material. What Are The Reasons To Use a Sample Presentation Evaluation? 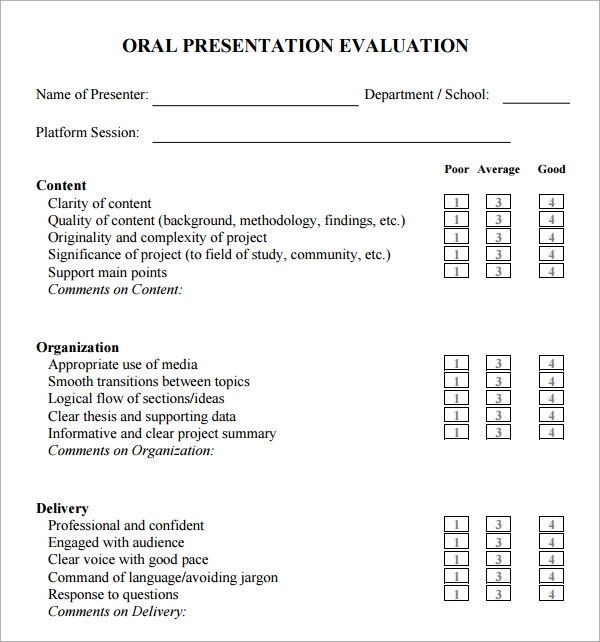 When to Use a Sample Presentation Evaluation? These can be used whenever you need to give a grade to a presentation, regardless of if it is in school or for work. If you need to be watching out for a few things during the presentation, then these templates are perfect to help you completely understand what you need to be watching out for. Also, they can help you to determine what feedback should be given as well as any points that should be handed out. These can be used for any grade level in school, including in college for any type of presentation. 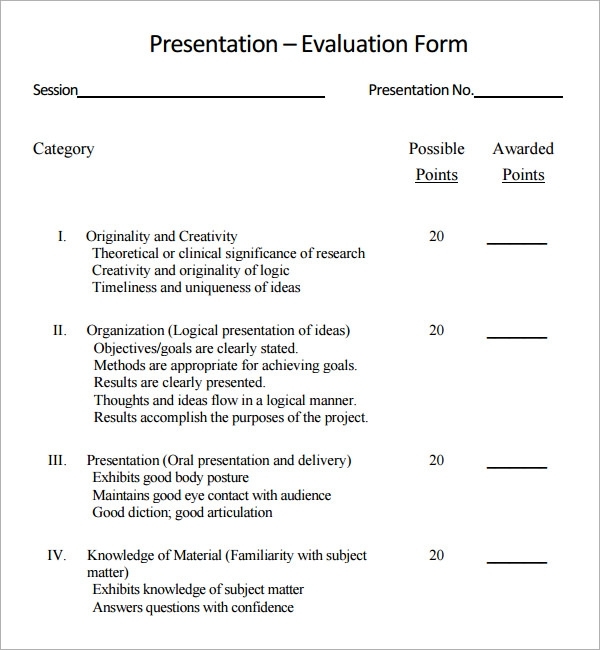 While the presentation is ongoing, you should make sure to keep writing down remarks on the sheet that will help you to make your decision. 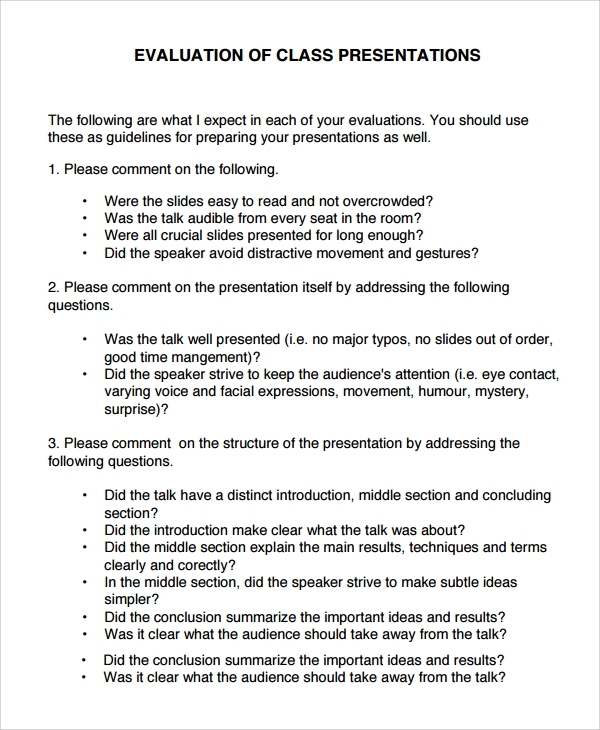 You can also write down any feedback that you think the presenter should know about and how they can fix that issue. 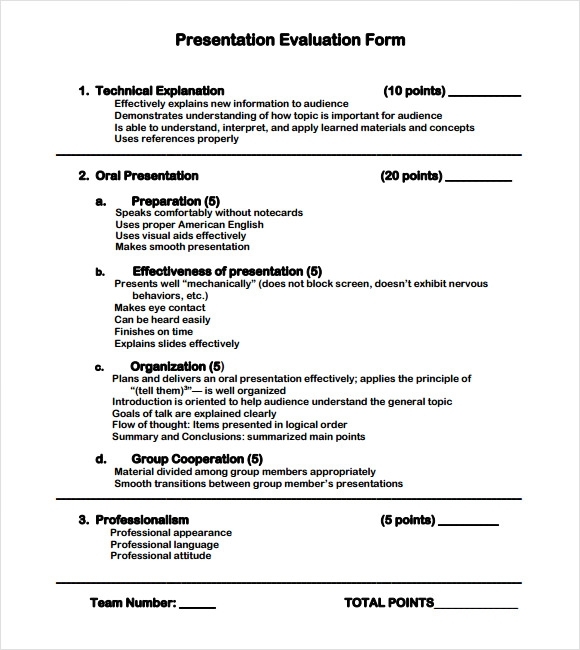 These presentation evaluations can help your teacher to determine if you are meeting all of the criteria that had been set for the presentation. There are numerous formats that can be used, so make sure to find the best one that would work for all of your requirements.